What a different day! Much cooler and quite nice. 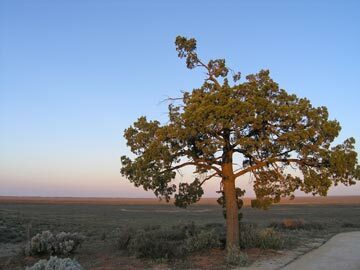 We pack up early and head out of Kinchega National Park via the township of Menindee south to Pooncarie. Again, there is a bit of green around but absolutely no wildlife, no sheep and no kangaroos. We see a few emus, that is about it. Pooncarie is a nice little town. The race meeting is on next week and the pub is being spruced up a bit and some repairs made for the large influx of visitors that are expected to arrive. This is a totally different place to Menindee. 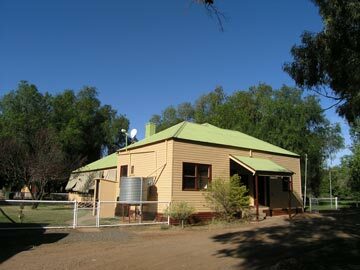 While Menindee is dirty and dusty, this town is nice and green. It has a great little park where we have morning tea. 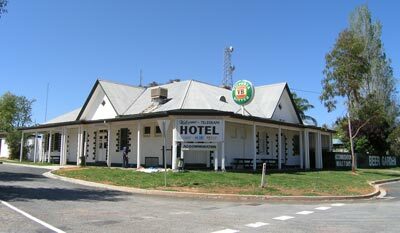 We get some bread and milk and have a beer at the very nice pub before setting off for Mungo National Park (you may have noticed that we visit every little pub we see). 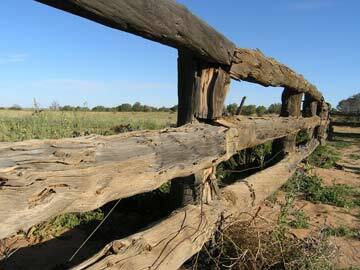 The drive to Mungo is easy and we arrive there about lunch time. We have lunch in the very good picnic area between the visitor centre and the shearing shed (there are also shearers' quarters you can stay at here). After a look at the visitor centre (probably one of the best I have seen in a NSW national park), we check out the shearing shed and then drive out to the Walls of China. This feature is only a few minutes away and we are soon walking out to the lunettes. Unfortunately there is a not a great deal of interpretative material on the walk and some of it is not all that helpful. 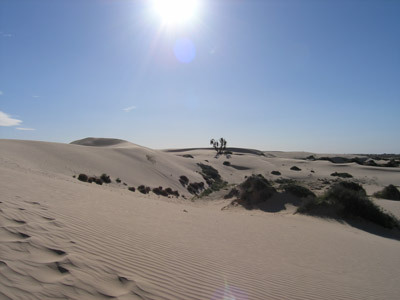 The sand dunes are spectacular, not because of their height or size, but because of the erosion that has created such fantastic natural features. We only explore a bit as we plan to come back for a better look tomorrow. We decide to do the Self Guided Drive Tour which is about 70 kilometres. This takes you up and over the Walls of China. There are a couple of small walks, one to the top of the dunes, one through the woodlands and other spots where it is nice to stop and sightsee. There is also a camping area called Belah Camp. Unfortunately, as the road is a one-way track, you have to go all the way around the 70 kilometres if you want to go to the visitor centre etc. Also, as we have not been able to find any real information about this camping area before the trip, we had decided not to stay there. However, it is very nice and would be a good place to stop so long as you plan your trip right. As we still have lots of time to kill, we cannot really stay here as we would end up with nothing to do for a few hours or have to drive right around the tour again to get back here (and then do more than half of it again the next morning). This is 70 kilometres of driving I do not feel like doing although next time I visit I will certainly stay here at least one night. 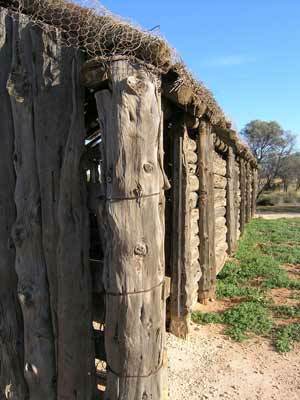 We stop off at the Zanci Homestead Ruins which are back near the visitor centre area. This is very interesting and the sheds and underground cool house most interesting. 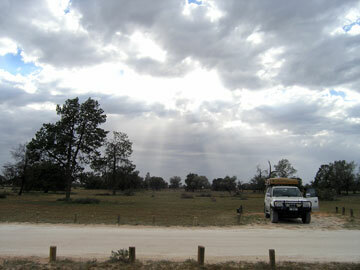 We go to the main camping area which is near the edge of the park and on the main (dirt) road into the park. Not the best place to put a camping area as there is a lot of dust from the many buses and cars that pass! All during the day we have seen heaps of cars and buses. There are more people here than all the previous five national parks we have visited put together. Luckily, most of them appear to be on day trips from Buronga or thereabouts and in the afternoon they head south. The camping area is large, but it is also very crowded. A new additional camping area really needs to be established. We go around the loop road a couple of times before we settle on a spot, just missing out on a couple of better ones. This is not the best spot, but not too bad. At sunset we walk a few hundred metres to a spot that looks out across the now dry Lake Mungo to the Walls of China. We have a drink or two and take in the nice view. We see a few pink (Major Mitchell) cockatoos as well as some kangaroos. After the usual nibblies, drinks and dinner, we head off to the centre of the camping area where the local Aboriginals are going to give a slide show and talk. There are at least 80 people waiting and it soon become apparent that the equipment being used, a Kodak slide projector designed in the 1950s and at least 30 years old is not going to work. Even manual feeding a slide into the projector will not show. A pity that 21st century equipment was available for them to use. We all go back to our camp sites a bit disappointed. During the night a very strong wind blows up. Our car top tent is shaking and about 3 am I have to get up to reattach the side walls to the ground as the pegs have been pulled out and it is flapping against the car. After I do this I look around and see that at least 20% of the other campers are also making repairs to their tents. It blows all night. Well, this looks like a repeat of two days ago. The wind is gale force and the temperature rocketing. It is already 30C by the time we break camp and head to the visitor centre. We have decided to do a guided walk that is being led by a couple of the Aboriginal traditional owners. This costs about $7 each (from memory) and it takes about two hours. It was very interesting and well worth doing. We were shown bush tucker, how to spot animal tracks and given a lot of history. By now the temperature is almost 40C and the wind blowing dust and sand everywhere. It is very uncomfortable. We have morning tea and decide that we are not going to stay the day here as exploring the Walls of China in this sort of wind and temperature is out of the question. I had originally planned to head south and west out of the park to get across to the Ivanhoe road but on the way in I noticed that the main road that comes from the south was also signposted to the north to Ivanhoe. This would be a much shorter trip. This section of land has just been added to the national park and it gives some good views of the Walls of China and Lake Mungo as well as the track we drove on the day before. It also crosses some of the other dry lakes in the system. The road proves to be in pretty good condition. 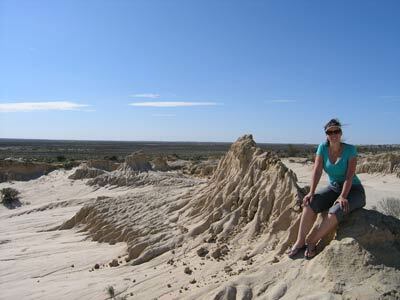 Our destination is Willandra National Park. It is a decent drive via the locality of Mossgiel. From here we take the road to Hillston and it is a bit cooler (perhaps only 35C) and less windy. We have lunch by the side of the road under a very small tree. There are no creeks or other shade to be seen on this whole section of road. 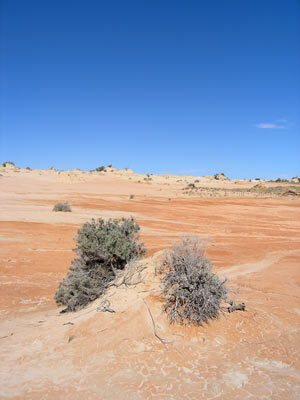 We enter Willandra National Park through a road that is not signposted but which is shown on most better maps. 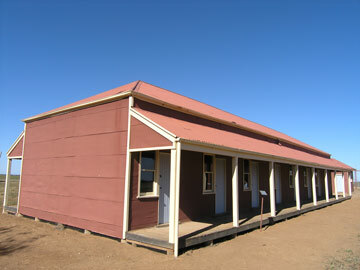 This brings us through the main part of the park to the Willandra Homestead area. We set up camp in the small and a bit overgrown camping area. It has a nice toilet and fireplace but could do with a bit of undergrowth slashing. We walk the short distance to the homestead. The magnificent 1918 building has been restored and is well worth a couple of hours exploration to see what the well to do sheep farmer lived like early last century. Note that you can stay in the rooms if you book ahead. We walk back to the camping area via the billabong walk, lots of birds but again, no kangaroos. Tonight I cook some great camp stove cooked pizzas. For the last part of this trip, click here.